Janice’s was her first quilt ’54-40 or Fight’ and was named after the quilt block she learnt as part of a sub group of Cromwell Quilters. 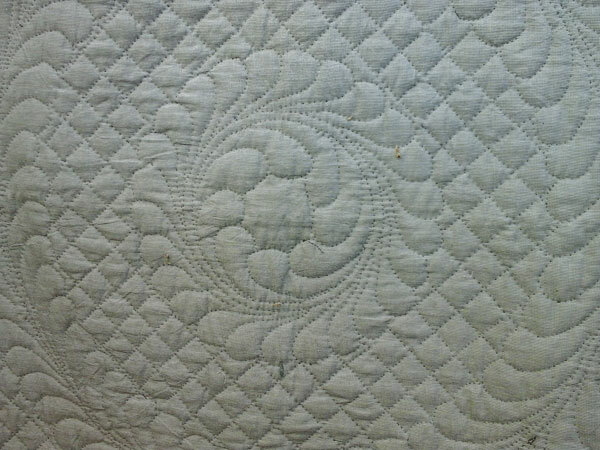 Made in the 1980s, the quilt is hand pieced and hand quilted. Janice talks about making the quilt, the sub group (later called the Bag Ladies) and the early days of Cromwell Quilters. Later she talks about where quilting has fitting in her life, around family commitments, and some of the different quilts that she has made. Bridget Buchan [BB]: I understand it, okay, so what I’m going to do first of all is just, for the sake of the machine and the recording say that this… I am in the house Janice Blackhurst in Bury, very near Ramsey in Cambridgeshire, and Janice’s number which I’m desperately looking for is TQ.2016.027. Janice Blackhurst [JB]: What’s that for? BB: So that’s your, identifies who you are Janice, that’s, as your, as your talking quilts, no it’s not your quilter skills number, it’s your talking quilts number. BB: That’s your, your number. So that just starts us off with a clarity as to who you are, and what’s happening. BB: And then I’m just going to ask you to tell me a bit about this quilt to start off with. JB: Well this quilt was one, I should think it was practically the first quilt that I made in its entirety because I’d always done blocks for charity work, group quilts, done a block and someone had stitched them together and they’d been raffled or they’d been sold. 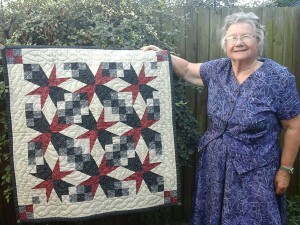 And then when I joined the Cromwell Quilters, Vine McGill was the chairman when I joined. And she decided, well perhaps her and the committee decided, we would split into small groups together with the… still have our monthly meetings, but to have these as an extra meeting to get to know each other better. And she gave all the groups a name, and we started off by being called 54-40 or Fight, because that’s the block we were making. Later on we changed the name or it was changed for us to the Bag Ladies which was much easier [Laughter] on the tongue. So this is the quilt that I… that I made. Now I don’t know if we had a, a size to do it to, I can’t remember that. But I remember I put the nine blocks and drew the nine blocks out on a sheet of paper. We were going to have the meeting in Vine’s house and I rang her up to say that I couldn’t go because I hadn’t done my homework, I hadn’t coloured in my blocks and done what I was supposed to. And she said well you’ll have to come because I’ve set a place at the table, table for you and I’ve made a cake. [Laughter] So I went off, and as you can see from this [Noise] it was done as a pattern for the nine blocks. And those nine blocks were set out and then I coloured it in as though it was one big block. JB: And I don’t know whether we had a size because it’s such a long, long time ago that I, I did that. BB: Was it your choice of colours? JB: Yes. Yes I, I suppose I’m rather fond of red really, yes I’m pretty certain it was my choice. We, we had to have a light, medium and dark I think. But I cut myself rather short on fabric so that when I came to do the border I’d only got enough fabric to make a small border. And even down to these tiny cornerstones I had to put those in because there wasn’t enough to go round. There wasn’t even enough to bind it, so I had to turn it in and do it like that. JB: I mean I must admit I was very pleased with it, and I even made my own quilting designs by folding up a piece of newspaper into sections and cutting it round and then marking it all out with the feather design. But it’s such a job to keep the colour on when you come to quilt. Very, very difficult to mark it out and keep it there. BB: Yes, what, what method did you use to mark it with? JB: I used tailor’s chalk, I used, a crayon, but this is such a long time ago that we didn’t have the fade away markers and that. So I think mainly it was done with tailor’s chalk. And I, as I remember it was red because I couldn’t see it otherwise. And I think that’s why it’s quilted with red thread or it’s, it’s quilted possibly with black thread and you can still see some of the red marks on it where I must have changed my mind over, over the quilting. BB: Yes I can see a bit there, that doesn’t matter. JB: But it hasn’t been washed and it has been hanging all this time on the landing to cover the gap in the stairs. BB: I’ve been looking at it to see, and I realise now how, though that the nine blocks are basically the same but you’ve changed the corners to make this lovely inner circle in the middle. JB: Yes because when you look at it from a distance you’ve got this circle in, in the middle. It wasn’t an easy thing to do. Vine was very good at designing and very good at distorting the blocks and making an ordinary block into something quite sort of stunning. And this is still one of my favourite things I think I did because I, it was before you even thought about really using the machine to quilt. In, when I did this everybody hand quilted. So it is the only piece, no I do have another quilt that’s all hand quilted. But I’d even hand pieced until, I suppose perhaps, I did this and I found I couldn’t keep up so I had to machine. But with the advent of the quarter inch foot it was much easier. I mean that revolutionised. BB: So, so when do you think, so we think this was still in the Eighties that you made this or would it be in the Nineties? JB: No it would be in the Eighties. BB: It’s in the Eighties. JB: Yes it would be in the Eighties. BB: So you joined Cromwell Quilters. JB: I joined Cromwell Quilters quite soon after. They, we had our 30th anniversary earlier this year and I didn’t join right at the beginning, but it was very soon afterwards. I should think I’ve been a member perhaps 29 years of the Cromwell Quilters. JB: Which is a long time, but groups change over the years, and when people say, oh I’ve heard that speaker I’m not going, I’ve heard that speaker. But speakers move on and we never remember everything they’ve said at the first meeting so you can always glean something from the next time you hear something. BB: Indeed, indeed, yeah. I’m, I’m interested hearing you talk about the Bag Ladies because I remember hearing people come to area days or regional days and talking about the Bag Ladies, were you one of the, was that one of the more successful sub-groups do you think? JB: Yes it was a very successful group and we ran for a very long time. And then we rather fell apart because one lady moved to Scotland, one lady died, we had another person join us but that wasn’t, that didn’t make the group disband, we had one member who didn’t ever take part in anything and she rather pulled, we rather felt she pulled the group down. She was so negative about anything and you only want one in the group like that and things don’t seem to go very well. And so by mutual consent we decided to disband. BB: But how long do you think it had been in existence for when you disbanded, ten years? JB: Oh longer than that I would think. JB: I can’t really say how long. Some of the groups are still going, but they’ve changed members, but we didn’t change members of ours and we didn’t have other people coming in to it. BB: So about how, how many would have been in that smaller group? JB: We had nine, I think we had nine. 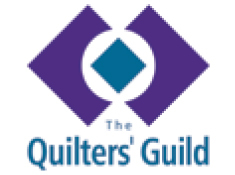 BB: And then the, the, Cromwell Quilters as a whole has an enormous membership doesn’t it. JB: We do now, we have a membership of over 80 now and it has been up to 100. But in those days it was a much smaller membership, I can’t say exactly, but we used to meet in the technical college in one of the mobile classrooms, and the ceiling was quite low and the floor bounced quite a lot. And I did have reservations when I first joined, are we going through this floor. [Laughter] But I was told by someone that as long as the floor bounced you’d very, they doubted very much anyone would go through it. So I don’t know. But there would be quite a weight on, on that with you know all of us. I think most people belonged to a group. I can’t remember, perhaps some people didn’t, they didn’t want to take part. But we were quite a high powered group because we had some very experienced people and very able people in it. I’m going to say I was one of the perhaps less able ones when I first joined. But we had Ann Stacey, we had Margaret Plumber and Margaret does beautiful work as does Ann and Vine. We had Jenny Moser, Maureen Taylor. Maureen Taylor was one of the first people to do City & Guilds and she’d done it in I think, I’m not quite sure where she’d done it before she came here, and so she was a great asset to, to the group. But we did a lot of group work with the Bag Ladies. We did things for each other. And if you go into the hall and look up the stairs you will see my prize possession, which was done partly by the Bag Ladies. BB: I will have a look in a minute. JB: You have a look. And there’s another thing that I haven’t finished, it’s all in pieces. Most of the things I, I did finish. There’s another quilt upstairs but whether I could quite find it I don’t know. But there might be some pieces leftover from it, [Noise] it’s strange these are here because you see I’ve been having such a tidy up in the conservatory that I found these. And we made a quilt of, we each, we made each other, I made sort of ten of those. JB: Or nine of those, one for myself and for everyone else. Now that’s. BB: So you’ve put down a bow tie, is this a tulip or some sort, a little? BB: Ah with, with one of these small, what about four inch squares, were they sort of six inch originally or four inches? JB: No they were four inches. BB: So, so somebody, so one person would have made all the bow ties? JB: No I did all of these. BB: You did all of these? JB: Yes I did all of these. And these would have been mistakes or I decided to keep myself one extra for myself to do something with. BB: So you had to make quite a few then for, for everybody else, it wasn’t just you made one. JB: No we made one for each person. BB: But then you made one bow tie, one of these flowers, one of the house? BB: Oh it was one a month. JB: One a month yes. BB: For a year, or for a certain length of time? JB: I’m not sure how many we did. I’ll have to get the quilt and show you. BB: So there’s a finished quilt with it? JB: So that we can see. But when you look at that you can see it’s quite difficult when you do flip and sew if you don’t get your pieces big enough they don’t, they don’t lap over. And when you’re doing it for a group you always do your best work. I think it makes you do things more accurately. JB: Because they are for other people. JB: And the same with this. I’ve always been able to get things accurate or pretty accurate but I’m not so good on my imagination and designing things. I have to rely on my accuracy to make things look good I think. BB: I don’t know, I think these look interesting. Very interesting, but yes, well we’ll have to take a picture of these. So these, these are the little, the four inch pieces that were part of a, a group project with the Bag Ladies and I’m going to go back to the… your, your chosen quilt just so that it’s clear what, because we’re muddling, I can feel that it might not be clear that we’re going with two different, we’re talking about two different projects. JB: I am a muddler so don’t worry. JB: Red, black and cream, it’s my clock. BB: Oh it’s your clock. The red, black and cream and grey. BB: Beautiful 40, 54-40 or Fight. So do you know what that means? I understand it’s a, a block name. JB: It’s a block name, it’s an American block name. BB: But what does it mean? JB: Well it’s something to do with the Civil War about… we’ll have to look it up. This is something I should have done beforehand but I’m sure I can find out something about it because I’ve got a Civil War book up there, I will find out for you. BB: So why do you think Vine chose this as a project. Do you think because it was, presumably other people’s finished pieces looks very different? JB: Oh all different and I can’t remember what they looked like because we didn’t take photographs then. We didn’t record our work like we do now. BB: Well this is what this is about. Making sure that that some of this stuff doesn’t get lost. So you’re, so now it is being recorded. JB: Yes, it did have a name on although it didn’t have a date, but it did have a name on it. So that’s… It’s not an, it’s not an easy design to do because it’s not easy to get these accurate here, these, these. BB: Well it looks pretty accurate to me. JB: Yes they are but, but I did have very nice fabric. You should… I’m going to say you should buy the best fabric you can afford. You shouldn’t buy it because it’s cheap because sometimes the weave is very off and it does shrink a lot when you wash it. I’m afraid I don’t wash fabrics very much but this was all good fabric. It would have come from Jenny Harris when Jenny Harris had her shop called Notions. JB: In Brampton High Street. BB: In Brampton, I remember Brampton, the shop in Brampton yes. JB: Yes and so we missed Jenny very much when she closed because this would have come, this would have come from her. BB: And probably just a fat quarter in, in everything except for the cream do you think? Or a long quarter? JB: No I, I can’t remember how it was bought it’s such a long time ago. I know I couldn’t match it up, I, I couldn’t. She’d sold it. Because being a small shop she didn’t have a whole bolt of fabrics, she only probably bought half a bolt of fabric. So you. BB: Once it was gone it was gone. JB: Because well it would have cost so much. Because in comparison fabric was still quite expensive then, nice fabric was still quite expensive then. And you hadn’t got the amount of shops to go to to choose. But Jenny was very good with her colours and she used to cut a fat quarter into what she called sticks. A fat quarter was cut into fours, four, and she would have rolled that nine inch square round with a rubber band and they would be in a basket. So you went in and you chose your fabrics from those little sticks. And then you chose then you went and bought it by the yard. Now you can always, I always found that I could choose three fabrics very easily, but to get the fourth I always found difficult to do. So it, it was, it was hard. BB: Did you get advice from Jenny in the shop do you think, or did you spend a long time humming and hawing? JB: No Jenny would give advice and Margaret Plumber worked in there some times and Margaret was always very good with colour and she would help us. And I did have a lot of help, but I can’t remember whether I had help with this. My mind’s a bit of a blank about it. The only thing that really sticks in my mind is trying to quilt it because I wanted it to be an all over design. I didn’t want it sort of in the ditch or I just wanted an all over design. BB: And what’s, I mean I see that there’s quite a contrast between the, the sort of, the squares and the spikiness of the piecing and then the, the spirals and curls and you know feathery type things of the quilting, I think that’s very good. JB: Well I think this was to soften it so that it didn’t look too angular. A lot, I think this is the piece of work that the most thought has gone into, because we were a very new group. You did your best work. It was going to be on show. And you just wanted to do your best possible. BB: Well clearly the fact that this is the one that you’ve chosen shows that you, still sort of has a, you have a pride in this one. JB: Yes well so many, I, so much of my work has been given away I don’t possess, I have got quite a few quilts that I’ve made for my grandchildren so they’re there for when I pop off. But I thought you wanted something earlier than that to talk about. BB: Oh I think it’s lovely to have this. JB: To talk about when I first started quilting, not, not sort of when I’m. JB: Getting in my dotage sort of thing. BB: Well I think you’ve, you’ve said a lot of stuff about the, the history of, of Cromwell Quilters, of Cambridge Quilters, I think you, you’re absolutely right it’s a brilliant choice. I’m just going to look and see if there’s any sort of question that we could have. JB: Do you want to turn that off for a moment? BB: So we, we’ve had a little break and Janice has found another quilt that looks completely different but is actually based on the same 54-40 or Fight block, and I’m struggling to see it but Janice is explaining to me how that came about. JB: I’d have to draw it out for you because it… the criteria of it was Jenny Harris chose each member of our group three, three fabrics and put them in a bag. And we each took a bag out of the basket with three fat quarters. And we were able to add some more fabric to it. But I forget how, how many. And I was the last one to take it out. We took them blind, we didn’t know what we were having. And I had the… the safari animals. And I’m pretty certain it is the 54-40 or Fight and I moved it over because I’m sure that’s what we had to do. I doubt if I’ve got all the things about it. But I went to Jenny to buy the fabrics to go with it. Jenny wasn’t in the shop, Margaret Plumber was there and Margaret helped me choose the colours. And she chose this one with the leaves because she thought the giraffes would like to eat the leaves. This one with the leaves on, she thought giraffes would like to use that. And then we chose this one because it had got footprints. 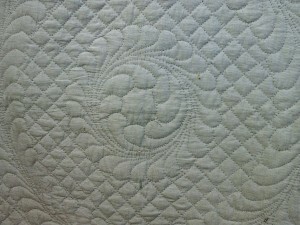 JB: And again this is all hand quilted. 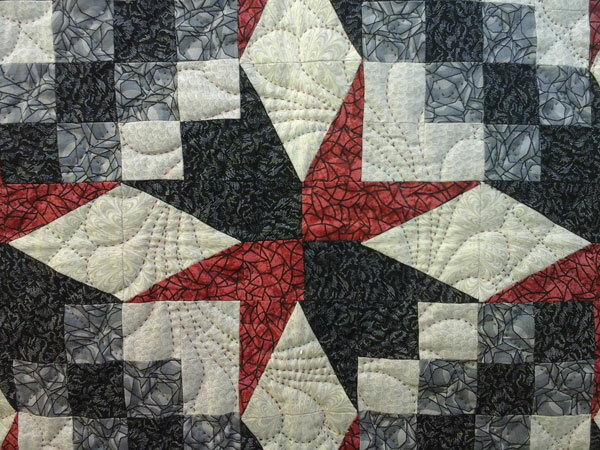 It would have been machine pieced but it would have been hand quilted. And this was made for my grandson’s third birthday, or that’s when I was going to give it to him and he’s never had it. It’s still here. And his mum says well leave it here, it’s quite safe. So I’m pleased they didn’t take it because that’s… that’s it. And then after everything was finished Jenny came and judged what she liked the best. And I won it. JB: My first time that I have ever won anything, and I was, I was just so overcome. And it was because I’d made the best use of the most difficult fabric she thought because she didn’t know what on earth anybody was going to do with it. But I do say thank you to Margaret for helping me choose that but… And this was one of those variegated ones. JB: That was a variegated one. So, but how much I had I haven’t a clue. And I think the backing would have come from some quilt sale, was somebody else’s. It, and it just, the colours just seemed to go, to go with it. BB: Yes, yeah well done you. BB: So what, what started you off with quilt making in the first place? JB: Oh well I started quilt making, I’d always wanted to do quilting ever since I’d been quite small and had a book, a storybook with a quilt on the front of it. And I had tried but had failed. I’d probably done hexagons and I don’t know I got fed up with them and it’s still upstairs in a box. But hexagons apparently were old hat. But I still feel [coughs] we shouldn’t forget our heritage and they are coming back into fashion. But we shouldn’t forget our heritage and I, when I used to teach patchwork I always started them off with a hexagon and they had to make a pin cushion. Because I think it’s good discipline to be accurate to do a bit of hand sewing because we can’t all machine. We’re not all dexterous with machining and machining isn’t for everyone. So I, I think there’s a place for hand sewing and machining. And when people say that quilting is very expensive I tell them to go back to hand quilting, take longer over it, and then it won’t be so expensive. It isn’t a race to keep up with everyone else, you work at your own pace and you do what you want. But I had been teaching lace making. I was ill, my mother died. I was ill and I let my young class get on top of me. They, I’d never had a class before that didn’t want to follow, I’m going to say the syllabus. They wanted to run before they could walk. And as I told them, you don’t start knitting with two-ply wool and a Fair Isle pattern. You have to learn to knit first. And it’s the same with lace making. But I was, I just couldn’t cope with it and so I gave up my lace making and I had about a year off possibly. BB: Was this at evening classes? JB: At evening classes yes. I taught for 19 years at evening classes and I did lace making, crochet, tatting and I wanted to keep the old crafts alive. And so I think I did my bit for society for keeping the old crafts alive. And I’ve still got people, I still, some of my I’m going to call them my girls still make lace. And the ones who struggled the most are the ones that have stuck at it. JB: And I’ve got, there’s several people make better lace than I do. Because I started teaching lace before I’d really done enough myself. But when lace had its revival you couldn’t buy text books or anything, you found it very difficult to get bobbins. So our first photocopies were very black and sticky and we used to take a pattern with all the little bobbles on and use heel ball across it to get the little dots and then prick it out onto parchment. I’ve still got all my lace making books, all my equipment, but I get tummy ache now leaning over the pillow. I just do it for special occasions. BB: So which college did you teach at, several? JB: No well mainly the, the adult education centre in Ramsey. I don’t quite know what it was called, the Ailwyn I suppose, the evening classes I did it there. But although I was under the umbrella of that we did it in Warboys. And then I did do it In Chatteris for two terms, but my contract wasn’t renewed. Not quite sure why it wasn’t renewed but it wasn’t nice going across the Fens. BB: So this was pre… your quilting, so sort of in the Seventies? JB: Yes, my son was born in 67- 68- 69- 70- 71- 72. 1972 because I had a year going to Bedford. I saw it at the East of England show. I’d always wanted to make lace because my mother had some lace bobbins. She dabbled in antiques. So I’d got this little bundle of lace bobbins and saw the lace at the East of England show and then out of the blue I had a phone call to say they were enrolling at Elstow, near Bedford. So I went off to enrol. I wasn’t there in time and was put on the waiting list. But the lady saw me and said I could go anyway although I was on the waiting list because she knew how badly I wanted to do it and all the long way I had gone. So it was 42 miles to go each way to do my lace. BB: Was that once a week? JB: Once a week yes. And my brother-in-law used to look after the children on Sunday afternoon so that I could do my homework. Because if you hadn’t done your homework it was no good going back to the next class. BB: So did you have to get the children to bed before you went off? JB: No it was a daytime class. BB: It was a daytime class. JB: That’s why I could do it, it was daytime class. And I did it when my son started school. I had to wait until I’d got them all at school. BB: And this was after you were widowed? JB: Yes. Because I was, I was widowed I hadn’t had my son when I was widowed so I was widowed in 66. BB: So this was part of your, your teaching was part of your sort of contribution to the, to the family upkeep I suppose was it, or was that? BB: Was that your little bit of independence? BB: But it was you away from the, the family, away from the farm. JB: Yes, well I, I looked after my father-in-law and two bachelor brother-in-laws in exchange for my, my keep and my board and my petrol really. I didn’t ever have any money from them for looking after them. But when I went back teaching on supply I had to contribute then to the housekeeping because it cost me more to house keep because I wasn’t, couldn’t do all the cooking, But I very quickly found out my children were getting out of hand and I preferred to have my children that I could manage and a bit less money. So I’m afraid my children all achieved, they’ve all got good jobs. One went to agricultural college, two went to university. They achieved but I didn’t. But if I’d have achieved I would have three layabouts and it’s more important that they achieved. BB: And I’m looking at stuff here that you have achieved and where we were coming from, you were saying about teaching quilting and I was asking how you’d, you mentioned that you had a group that you were teaching quilting and that’s, you said that came, no I said how did you start in quilting yourself, but that was after you gave up lace? JB: It was after I gave up lace yes. And most of… I learnt to quilt with the Cambridge Quilters because we had it on a long quilt on a trestle in people’s houses. After we had pieced the quilts they were put on this, these rollers and we used to go to one house and we would all sit round the quilting frame and we would quilt. And Ursula Simon taught me to quilt. And we had to have a great long thread and it was taken through and one person had this end and the other person had that end so that you had your quilting thread as long as possible. And I can remember having to take it out when I first started because I didn’t get it small enough because Ursula’s quilting was, I’m going to say out of this world. And I learnt to appliqué with Deidre Anniston, I went to… is it Burwell House? Uh used to be for children, but they did adult education there. And I went to do appliqué there and that was in 1986 the year my dad died, just for a few days. And I can’t show you that because my granddaughter has got that on her bedroom wall. I doubt if it’s there now, they’ve just moved. But that was Little Bo Peep and it had woolly sheep round the outside and at a very young age she had to stroke the sheep before going to bed. JB: So but mainly I learnt my quilting at the Cambridge Quilters, being a small group and we did you know a lot of, a lot of group work. A very close knit group. BB: So the quilting came when you felt like you’d come to the end of the teaching lace and you remembered this picture on a book and you thought, you sort of… that had always been there, this idea of taking up quilting. JB: Yes, always been there but I don’t quite know where I met Deidre Anniston, I can’t quite remember how that came about. My daughter had gone to university and we’d always done a lot of things together. This was my middle child as my son went to agricultural college before she went to uni because there’s only a year’s difference between them, and you can go to agricultural college sooner than university. So I was rather left high and dry. One daughter was married, she married as a student. He’d gone off to agricultural college, and Rachel had gone to uni. And I was a bit lost… very lost. So I had to find something to, and mainly so I had something to write to her about because I used to write to her each week. No mobile phones and that sort of thing. You, you sort of wrote to your children and I had to have something to write about. So hence trying to do something. And she can remember the letter I wrote to her when I said I feel as though I’ve been… I’ve actually made it with the Cambridge Quilters, I’ve been asked to do a piece for the group quilt. And it was a little triangle with a rose on it and we were given this little tiny piece of paper about that big and we had to make it up. Because Jane Anniston was a very good artist and this little thing came and it had to be scaled up to fit into this triangle. Because we were given the fabric, so we marked all-round the edge of the triangle so that we didn’t go into the turnings. And I just could not scale this thing up. And one of my lace girls did it for me. I just took it in with me and said is anybody good at this and it was done in a matter of seconds. So… so yes. So I was, I suppose I must have been quilting at the same time I was doing lace. But as I say I gave up, I gave up the lace, but so they did overlap. But how long for I don’t know. BB: That’s very interesting. Talked about Cambridge Quilters and adult education which is so many things that have changed now. JB: And the other thing I used to do I used to go to Loughborough Summer School the… university summer school. And go for classes with Sheila Scorne who used to. BB: I don’t know anything about that, tell me about that. JB: Well Sheila used to write in Patchwork and Quilting and she went through the alphabet and sort of A and she talked about something with A and that and I haven’t, I haven’t kept the pieces. But I’ve lost touch with Sheila now. I was in touch with her until about a couple of years ago, or perhaps even this year, so whether she’s still doing the classes I don’t know. I mean I’m 80 next year, and she’s a lot older than me, so she’s perhaps still not doing her classes because even when I went she was finding it quite hard to do. But she was a very talented person. BB: So this would be a week summer school. JB: Yes about a week summer school from Sunday to Friday. BB: And following one project through for the week? JB: No we did lots of projects. She would do a different project every day, so you came back with lots of things unfinished and they’re still unfinished some of them after all those years. We went to… Sheila did a course in Hope in Derbyshire where we went and stayed in a bed and breakfast and she did it in somebody’s studio. But that wasn’t a success, that, that didn’t work very well because the lady was doing bed and breakfast for the men working on the reservoir and when they were late into breakfast it didn’t go, it didn’t fit in very well. So you know I… I don’t know, but yes I’ve been on lots of courses trying to… And now I go to Belsey Bridge with a group and we just do our own thing. We have a week, well not a week, just a few days sewing. And it’s nice to go away and sew with like-minded people and have everything done for you, you know. Because when you live alone it’s so nice to have someone to cook for you. BB: Absolutely. So have you got anything else that you’re yearning to learn in quilting, the next challenge? JB: No I, I’ve said I don’t go to many workshops now because I don’t seem to finish things and I’ve got so many things unfinished that I really should stop going to workshops and try to do what I’ve done. I’ve said I’m doing, I’ve said to somebody I was doing quantity rather than quality but they didn’t agree with me, they said because I would always do quality however much quantity I did. It would still be accurate so it’s me, I have to be accurate. It has to be as accurate as possible. BB: Is that the thing you’re most proud of, your accuracy do you think? JB: Well so people, people comment about it more than anything. It’s something, as I’ve got older, the last year or two I have found it harder to become accurate. And we had one of our members in the Bag Lady, Ladies who was quite a bit older than us and we always used to laugh and say oh dear that’s Jenny, that’s not, but I don’t think she could help it. But we didn’t realise that at the time. BB: You don’t think that’s an opportunity if you can’t be accurate for you to try something more free maybe? JB: Well it perhaps is, but that’s not me, that’s not me. I don’t know what is next. I gave my daughter a quilt for a 50th birthday present, to give to a friend for her 50th birthday and I now want to replace that because that was one I’d earmarked for my grandchildren. And I would like to I would like to… not replace, I’d like to replace it. I can’t replace it entirely because I’d never get all the fabrics. And it was called lavender and sage, and it was all shades of green and it was churn dash. I think it was churn dash, shades of lavender and green. And when it was hung up at the Cromwell Quilters exhibition the comment was the colours aren’t evenly through it. This is other people because it’s not juried. Are you going to take it apart and even it up, and I said no I’m not. And I, I couldn’t think why I’d done it like that. And the thing was I laid it out on the top of my bed to see where the thin pieces went and all the pieces I liked the best went on the top of the bed. And the pieces I didn’t like so much went on the sides and the bottom. So consequently it looks marvellous on the bed, but not quite so high up. And I can send you a photograph of that because I’ve got it on my computer, because Helen sent me a photograph of it in situ. So I could send you a photograph of that. BB: Well you could do couldn’t you. JB: And I did machine quilt that because I don’t know how many years ago, I bought a Janome 6-60 so that I could quilt. But you tend to think about your quilting before you make your patchwork so that you do your patchwork and you know you can quilt it. Or at least that’s how I, how I’ve done it yes. Yes. JB: I suppose because it’s, you meet so many different people. I’ve been on quilting holidays. It’s a means of going on holiday on your own, you don’t have to have a partner or somebody to go with. You can go on your own. You can go to a quilt show on your own, you don’t have to have somebody to go with you. And I suppose I am a bit of a loner. I mean over the years I mean I’ve been widowed now 50 years this year, I’ve had various men friends, but they… in those days when I was first widowed men wouldn’t have taken on three of somebody else’s children like they would now because families are so mixed up now that it doesn’t seem to matter. And people, men would have accepted me but not my children, and we came as a package. And now as I’ve got older I could never think about settling down with anybody because I’m not going to be told what I can do and what I can’t do. I’m afraid I’m too, I’m going to say I’m too pig headed for that. I could never share my house or my life with a man now, and I mean I say that to people and that’s, I just couldn’t. You become selfish over the years without meaning to. BB: So almost you’re saying that quilt making has, has been a relationship in a way. JB: It’s been my salvation really as, possibly, lace making was when the children were younger, because I used to go on lace making holidays. When the children went back to school I could go away for three or four days and my brother-in-law would look after them as long as he didn’t have to look after them at the weekends. And they got them, they were very self-sufficient children. 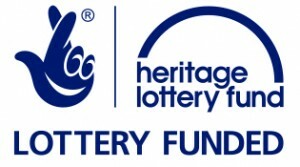 I probably brought them up to be too independent because in Wistow Village when I was quite young and first went there we had at least three young mums die leaving small children. And I knew that my brother-in-law would look after them financially but he wouldn’t have been capable of looking after them cooking and doing that sort of thing for them. So, because he was a Lancashire men, man, and Lancashire men have to be looked after, it’s not like men round here, it’s a different relationship. So I used to go off and, but I always let school know that I was away for three days or so. And I started doing that when the children, when we stopped having family holidays because once they started going away with the school and doing things and they got older they didn’t want a family holiday at the seaside, they wanted to do what they wanted to do. So as your children get older your life changes and you have to let your children develop and you know, you still have sort of, none of them were too wild. Mary I suppose married at 20 which was far too young and the marriage didn’t last. But then she’s not alone in, in that. And there weren’t any children which was a blessing. But she is married now and does have two children who are teenagers. So I’ve been, I’ve been through the mill with my children. BB: I think it’s probably time to stop. Do you think? JB: I don’t think I’ve anything else to say.